The introduction of hashtags to Twitter and later on to other social networking websites such as Facebook and Google Plus has revolutionized the way people interact and share resources on these platforms. For us in education it means an easier way to find, access and share educational materials with a global community of teachers and educators. By definition, a hashtag is a topical term preceded by the sign #. Hasgtags are especially effective in creating conversations and discussions around a given topic, following updates about events and conferences, aggregating content on a particular content and many more. Twitter is probably the platform that has much success in the use of hashtags. Since its integration a few years ago, Twitter stream is now teeming with all kinds of hashtags whether it’s for a political cause, environmental issue, or for live updates on an ongoing show, you name it, you will probably find a hashtag for it. To be able to use a hashtag, you only need to have an active Twitter account. Hahstags are embedded within tweets and they do not belong to anyone. Once the hashtag is created and goes viral, nobody can control it and everybody can use it. Check out this post to learn more the educational power of hashtags. In previous posts here in EdTech and mLearning, we featured a number of key educational hashtags and today we want to particularly highlight some of the best hashtags for teachers using iPad in their instruction. 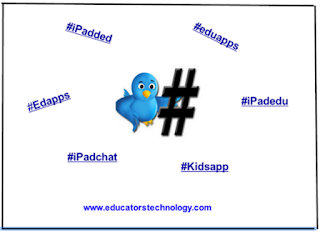 The hashtags below will provide you access to a huge repository of educational iPad apps, tips and resources. Check them out and share with us if you have other suggestions to add to the list. Use this hashtag to search for educational apps to use in your classroom. This one covers news, tips and resources related to the use of iPad in education. This is one of the most popular hashtags in educational Twittosphere. You can use it to look for resources on educational technology including mobile apps. This is another hashtag for reviews of educational apps to use in your teaching. Similar to #edchat, #iPadchat is for taking part in conversations on topics related to iPad and its use in different sectors in life. Like #iPadEd, #ipadedu is for tweets about the use of iPad in education.